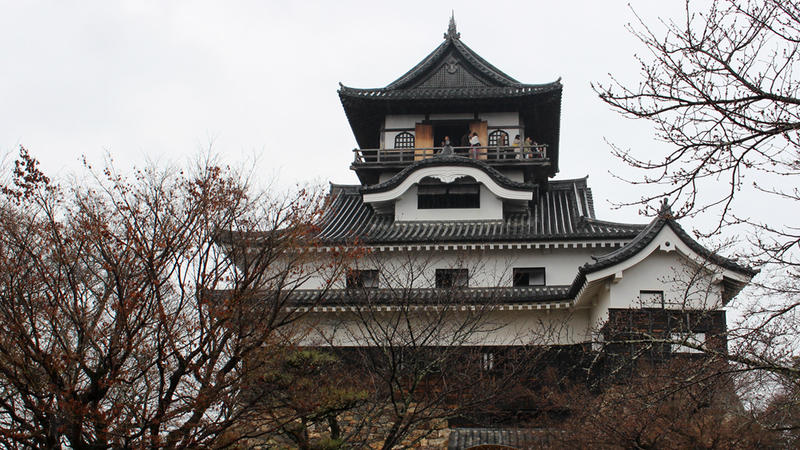 Inuyama Castle, [犬山城, Inuyama-jō] is one of the oldest still standing castles in Japan. It is also only one of five castles total in Japan designated as a national treasure. One of the other four is Matsumoto Castle, which I walk by everyday on the way to school, and one of the first blog posts I wrote. I visited Inuyama Castle on the way to Kyoto during spring break, and it was raining incredibly heavily, so I apologize for the somewhat lower picture quality in this post, I’ll try to edit them as best I can. Inuyama Castle is in Inuyama Castle, the northwestern part of Aichi prefecture. The castle itself is roughly a 20 minute walk from the Inuyama Station, although it’s not a JR railway stop so not that useful. Honestly, there isn’t that much to do in Inuyama, is it is great for driving by on the way from one place to the other. There are quite a loot of parking lots around the castle so access by car isn’t too tricky. I’m 15 and I don’t drive so just Google Maps how to get there. You can tell that I am 15 because I use Google Maps as a verb and then commented on the fact that I did just that – meta. The castle grounds are open everyday except during New Years from 9 am to 5 pm. Entrance tickets are 550¥ for adults and 110¥ for elementary school and junior high school students. There are various discounts for larger groups as well. The construction on the original castle was completed in 1440, however, as with anything old in Japan, the castle was rebuilt and modified several times, most notably in 1537, and additional buildings were built and torn down over time. The current design is believed to originate in the early 1600s. The castle appears to have 3 tiers, however there are actually 4 stories in the inner part, similar to how there is a hidden story in Matsumoto Castle as well. There are also 2 stories underground. The castle has a total height of 24 meters, 19 when not counting the stone wall. The story just under the top balcony is called the Karahafu room, as it has special Karahafu gables, with their distinctively curved, Chinese shapes on the southern and northern sides. The east and west have plover gables, which are triangular in shape. These gables were added as decoration long after the original castle was constructed, in the mid 1600s. There is an attached turret on the southeast corner. It was designed for the purpose of offense and defense and provides a good view of the surrounding areas through the two wooden-frame windows. The inside of the castle is surprisingly barren, although there are a few prints and images hung on the walls and a few suits of armor displayed. What is most impressive is the wood and stone interior which has been largely preserved. To advance from one story to the next, you have to climb a set of incredibly narrow and unbelievably tall steps. The steps were easily 30-40cm apart. Since you have to carry your shoes with you in a plastic bag [as most castles and temples require you to do], make sure you have a free hand to really hold onto the railing well. Once you reach the top of the tower, you can do a full 360° viewing, that is if you are not afraid of heights. The guard railing is only about half a meter high. The castle is surrounded by lots of nature, as you can see in the map above, and there are many beautiful cherry trees, however I was unfortunate enough to miss the cherry blossom season by just a few days. From the top of the castle you can see Kiso River flowing by, and there is a great view of the traditional castle town. And that’s all there really is to say about Inuyama Castle. I had a good time [despite it raining heavily], and I would really recommend you checking it out if you ever find yourself in the general area. This was the first place I visited during my trip to Kyoto, so expect a lot more coming from here really soon as I can’t wait to share it all with you. The pile of entrance tickets and flyers is staring at me judgingly, so I better get on to the next blog post before it tries to consume me whole. If you ever have any questions or just want to say hi, leave a comment below. You can also follow me on various social media if you want to see more images or simply have a chat!